The link below is to an article that takes a look at the Scorpion Beetle (Onychocerus albitarsis). The link below is to an article that reports on the creation of massive new national parks in Chile. The South American horned frog packs quite a bite. South American horned frogs (Ceratophrys) can capture and swallow whole animals up to their own body size, including other frogs, lizards, snakes and rodents. This is possible because they have jaws that can produce an extremely forceful bite. Just how powerful is the bite was part of our study, published today in Scientific Reports. We found that small horned frogs – with a head width of 45mm – can bite with a force of 30 Newtons (N). That would feel like having three litres of water balanced on the end of your fingernail. More impressively, the largest horned frogs from Brazil – with a head width of 100mm – are calculated to bite with a force of 500N. That’s like having 51 litres of water balanced on your fingertip. A bite like this is similar to that of reptiles and mammals with heads of similar size. Bite force was measured using a special device called a force transducer. Unlike most frogs, horned frogs willingly open their mouths and bite objects (or fingers) as a defensive response. An example bite force trial. Credit to A. Kristopher Lappin. This makes it easy to place the free ends of the device into the frog’s mouth so that it bites forcefully, and the device measures the amount of applied force. The free ends of the device are covered in leather to protect the animal’s jaws and to provide a naturalistic gripping surface for the teeth. Our study is also unusual in that the relationship between size and bite force was measured using multiple measurements from the same individuals from different points during their growth rather than just using a sample of different-sized individuals. An adult female horned frog (C. ornata). There are other large frogs that prey on vertebrates but horned frogs are arguably the most aggressive and voracious. In the wild they will sit patiently, partially buried and well hidden, and attempt to ambush anything unfortunate enough to wander in front of them. If just out of reach, the horned frog may lift one or both rear legs over its head and wiggle its toes to attract the attention of the potential meal. Once the victim is in range, the frog will rapidly lunge forwards with a wide open mouth. The extremely adhesive tongue sticks to the prey and retracts, pulling the prey into the mouth, and the huge jaws clamp shut with great force to prevent escape. 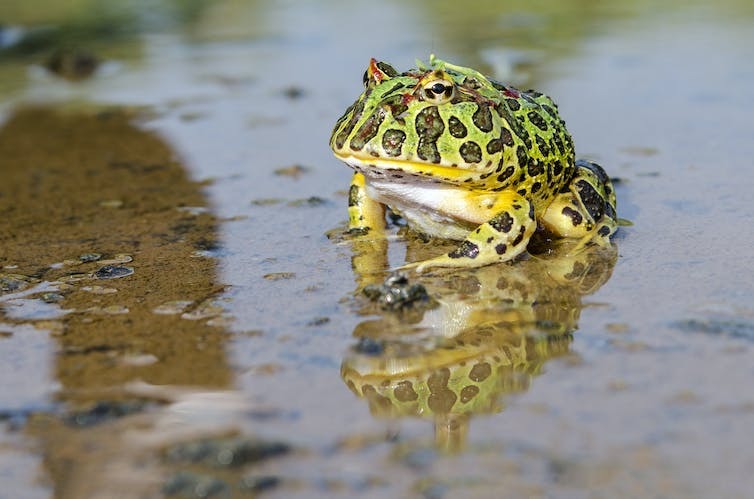 This mode of predation contrasts with the majority of the more than 6,800 living species of frog that do not hide to avoid detection by prey, have weak jaws, and rely primarily on their tongue to catch small insects. 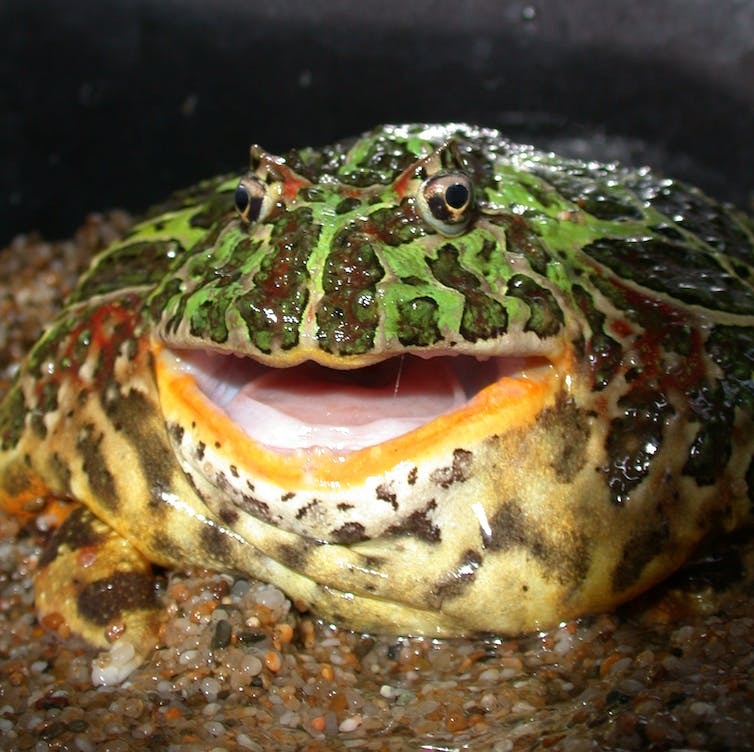 Because of their voracious appetite and stout shape dominated by a huge mouth, horned frogs are often referred to as Pacman frogs after the popular arcade game. This, along with their attractive colour patterns, has made them popular as pets. Wild horned frogs tend to be spotted or striped with various greens and browns – effective camouflage – but captive breeding has led to a variety of colour morphs involving bright reds and yellows, with names such as dragon wing, lipstick, leopard, and two-faced. Associated with the impressive bite forces of horned frogs and their ambush lifestyle are several important anatomical traits. They have a heavily built skull in which many of the connections between individual skull bones fuse together as the animal grows. Cranium of a Brazilian Horned Frog (Ceratophrys aurita) based on micro X-ray Computed Tomography. Credit to Marc Jones, Joe Groenke, and the Natural History Museum Los Angeles County. Along the upper jaw is a battery of small but sharp and recurved teeth, and at the front of the lower jaw is a pair of large bony fang-like projections (called odontoids). The sticky tongue of the horned frogs has been compared to pressure-sensitive adhesives and some species have plates of bone within the skin of their back. The horns in horned frogs are small pointed structures above the eyes. Their prominence varies among species, and they may help to camouflage the frogs by looking like the tips of the leaves on the forest floor where they sit in wait for prey. Horned frogs are not currently considered endangered but some species are considered near threatened. Like many animals they are suffering a loss of natural habitat. They are also often killed by local people because of false beliefs that they are venomous, and collection for the pet trade may also be significant. Bite forces of some ancient frogs may have been even more impressive than those of today’s South American horned frogs. Beelzebufo ampinga is a large heavily built frog from the Late Cretaceous period of Madagascar with a skull at least 150mm wide. Like Ceratophrys it has a robust ornamented skull and teeth with a single point (not two points like most amphibians). Detailed comparisons with the available skeleton suggest that its closest living relatives might be the South American horned frogs. When the relationship between bite force and size in the South American horned frogs is applied to the skull width of Beelzebufo the value obtained is 2,200N. That’s a massive 224 litres of water balanced on a fingertip – more than three times the weight of an average Australian woman. A bite of this force is comparable to estimates for mammalian predators such as wolves and female lions, and within the realm of bite forces measured for crocodiles and turtles with similar skull widths. For context, the bite force of an adult human male averages only about 25% that of a large Beelzebufo. With a bite like that, Beelzebufo would have been capable of easily overcoming small or juvenile dinosaurs that shared its environment. The Amazon is the largest rainforest in the world. 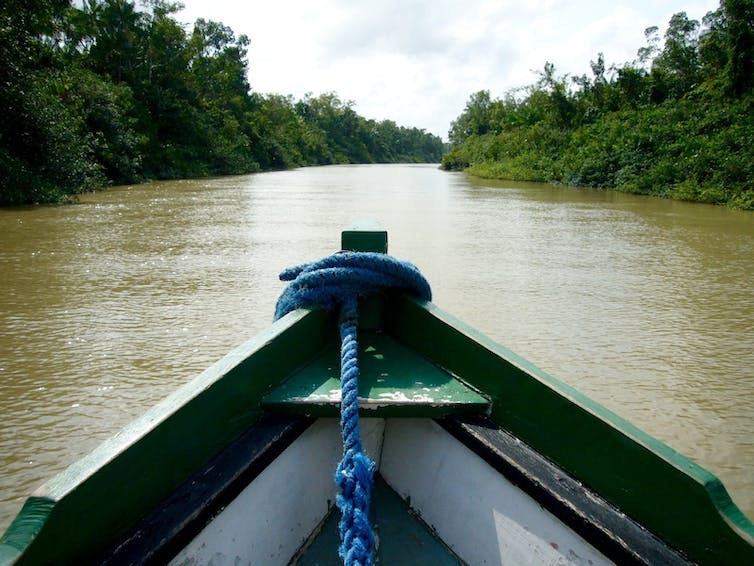 The Amazon, often described as the “lungs of the Earth”, is the largest rainforest in the world. Its extraordinary biodiversity and sheer scale has made it a globally significant resource in the fight against climate change. But last week the Brazilian president Michel Temer removed the protected status of the National Reserve of Copper and Associates, a national reserve larger than Denmark. The reserve, known as “Renca”, covers 46,000 square kilometres and is thought to contain huge amounts of copper, as well as gold, iron ore and other minerals. Roughly 30% of Renca will now be open to mining exploration. Renca also includes indigenous reserves inhabited by various ethnic communities living in relative isolation. The decision, which has been denounced by conservation groups and governments around the world, comes as the unpopular Temer struggles with a crushing political and economic crisis that has seen unemployment rise above 12%. Brazil is currently in the middle of the largest corruption scandals in its history. Since 2014, an ongoing federal investigation called Operation Car Wash has implicated elite businesspeople and high-ranking politicians, uncovering bribes worth millions of dollars exchanged for deals with the state oil company Petrobas. According to the BBC, almost a third of President Temer’s cabinet is under investigation for alleged corruption. However it’s not clear that this move will benefit ordinary Brazilians. This is not the first gold rush into this area, and the Amazon still has high indices of poverty and many other challenges. During the 1980s and 90s tens of thousands of miners flocked to gold deposits in the Amazon, driven by high international prices. One of the most famous examples, “Serra Pelada,” saw 60,000 men dig a massive crater in the Amazon Basin. These mining operations typically provided little economic benefits to the local populations. Instead, they attracted thousands of people, which led to deforestation, violent land conflicts and mercury pollution in the rivers. In reality the Amazon and its people deserve a sustainable model of development, which takes advantage of the outstanding biodiversity and beauty of its standing forests. The historical record shows mining is likely to lead to a demographic explosion, and further deforestation, pollution and land conflicts. One important aspect of international environmental law is called the “principle of non-regression”. The principle states that some legal rules should be non-revokable in the name of the common interest of humankind. Essentially, once a level of protection has been granted there is no coming back. All have the right to an ecologically balanced environment […] and both the Government and the community shall have the duty to defend and preserve it for present and future generations. The Brazilian constitution also describes the Amazon forest as a “national heritage”. It must then be treated accordingly. While the Amazon is a fundamental part of Brazil’s history, it’s also an essential part of the global battle against climate change. The Amazon contains half the worlds’ tropical rainforests, and its trees absorb and store vast amounts of carbon dioxide. According to the Intergovernmental Panel on Climate Change, land use, including deforestation and forest degradation, is the second-largest source of global emissions after the energy sector. Developed countries around the world have committed resources to help Brazil offset the costs of safeguarding their forests. One example is the Amazon Fund, created in 2008. It has received billions of dollars from foreign governments such as Norway and Germany, to combat deforestation and to promote sustainable practices in the Brazilian Amazon. But with 14 million Brazilians unemployed, further assistance is required to ensure that they can protect their forests. As well as governments, companies have also committed billions of dollars to fight climate change and support projects that reduce carbon emissions and promote energy efficiency. Most businesses have also created self-regulatory standards to ensure compliance with international laws and ethical standards. The decision of the Brazilian government leaves us with two questions. How will the international community honour their commitments to keep global warming below 2℃, if countries begin rolling back their environmental protections? And how will companies involved in mining projects in the Amazon honour their social responsibility commitments and moral obligation towards present and future generations? The degradation of the Amazon will affect the entire world. The clearing of the Amazon for mining will lead to the emissions of thousands of tons of greenhouse gases, furthering global warming and causing the irreversible loss of biodiversity, and water resources, as well as damage to local and indigenous communities. Let us not take a step back towards more destruction. Rather, let us strengthen the protection of our remaining forests. The link below is to an article reporting on the Pantanal Wetlands in South America.